So, I'm going through a bit of a stamping funk. I think it's stress from the holidays and trying to figure out WHEN I'm going to get it all done. I've lost 2 days this week because of sick kiddos...10 days til Christmas!!! Oh my!!!! I also heard a blizzard is coming our way. I must use each and every minute to it's fullest. 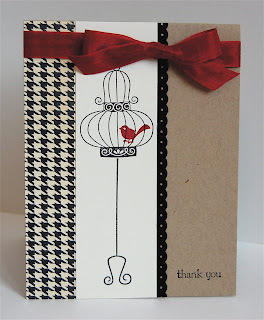 I received a huge box of stamping goodies a few days ago and that usually gets my mojo going, no can do? I can't tell you how many scraps I've made over the last few days...Finally I made this adorable thank you card using my new Aviary stamp set & Love Letter dsp! I turned to my trusty notebook filled with tried & true sketches and found something I could finally make work! What do you do when your Mojo takes a vacation? Love the card. It is very cute. When your MoJo takes a vaca it means you need a vaca too. Take a break. Toss yourself on the couch with a book or watch a movie. Forget about everything and spend some time with YOU. This is usually all it takes to get the engines going again. You are just running on empty and need a break! Ok........a lecture on your blog! Now THAT is a first. Fantastic Card and i love the red little bird !! I LOVE this card! When I lose my mojo for card making I take on a new project like baking or crochet, reorganize craft stuff, paint a room...lol! Love this stamp set, and a fave color combo of mine! !